I have been having some difficulties getting a live model. I have asked all my friends if they would pose for me. They all know I am now an artist but not a single friend has agreed to pose. I even offered to put on the heater but it seems people of a certain age are unwilling to disrobe for a friend no matter how talented an artist he is. What was I to do? 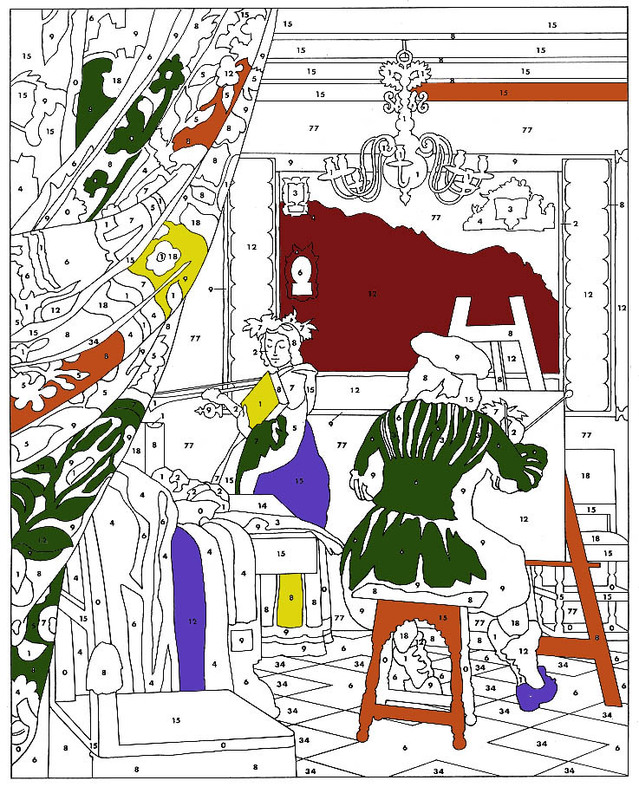 The Maestro said I had to do live drawings but nothing alive here would pose for me so I had to look further afield. 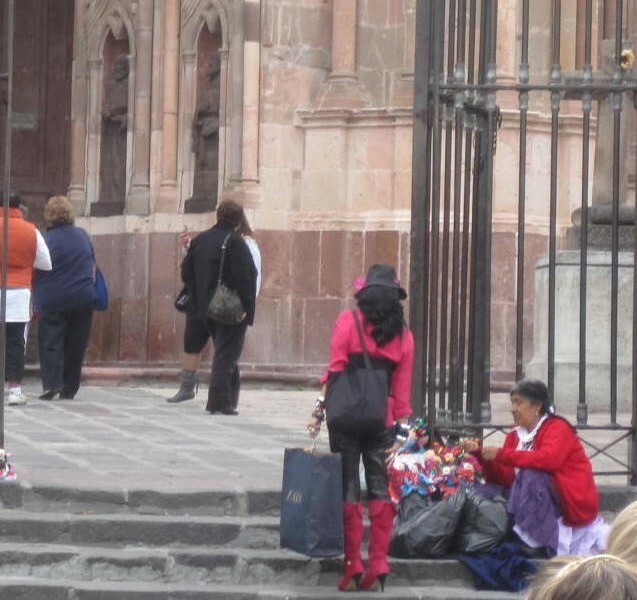 Discouraged in San Miguel, I hopped on a bus and headed for Dolores Hidalgo. I knew good things such as the Mexican independence movement started there so maybe it would help me become an independent artist. 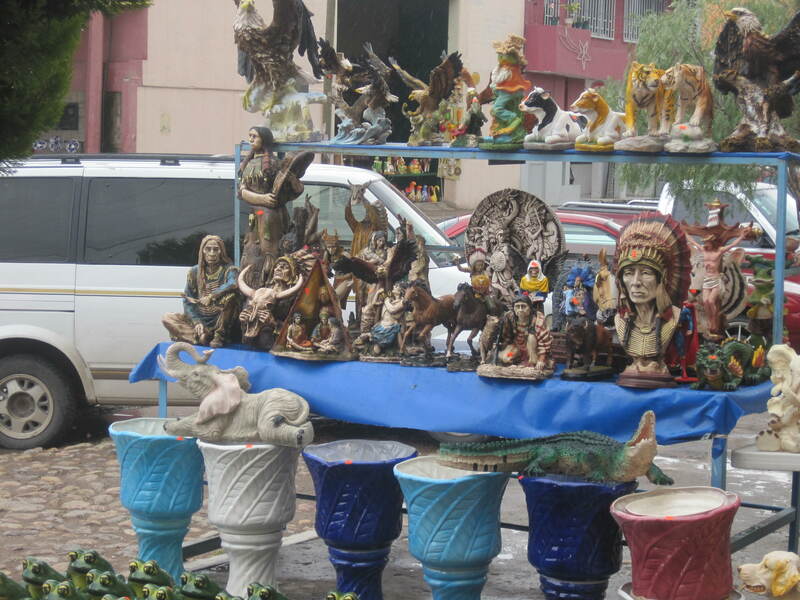 When I arrived there was a huge Feria like the one at the Instituto Allende but without the attitude and jewelry. Even the presentation was different. These lovely statues caught my eye first. 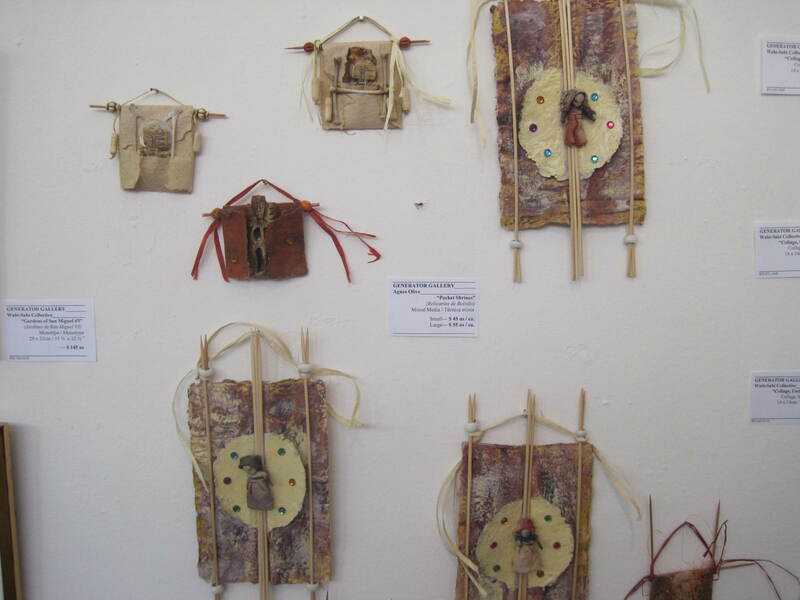 But I had seen this stuff back home and the Wizard of Morelia told me to use local materials. Then I found the Frogs of Dolores. I never thought of Frogs as models and wondered how they got them to sit still but there they were. 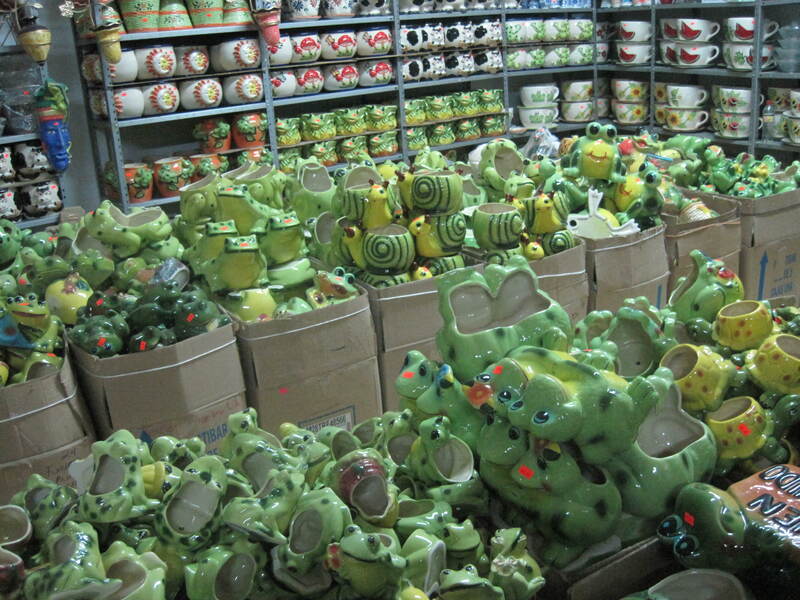 I saw Frog cups, sitting Frogs, laughing Frogs, planting Frogs. I had never seen a Frog in San Miguel. I have seen lots of dogs but never a Frog. I never saw a Frog in the market so I knew that Frogs weren’t going to work for me. Then I saw Bells and Angels. 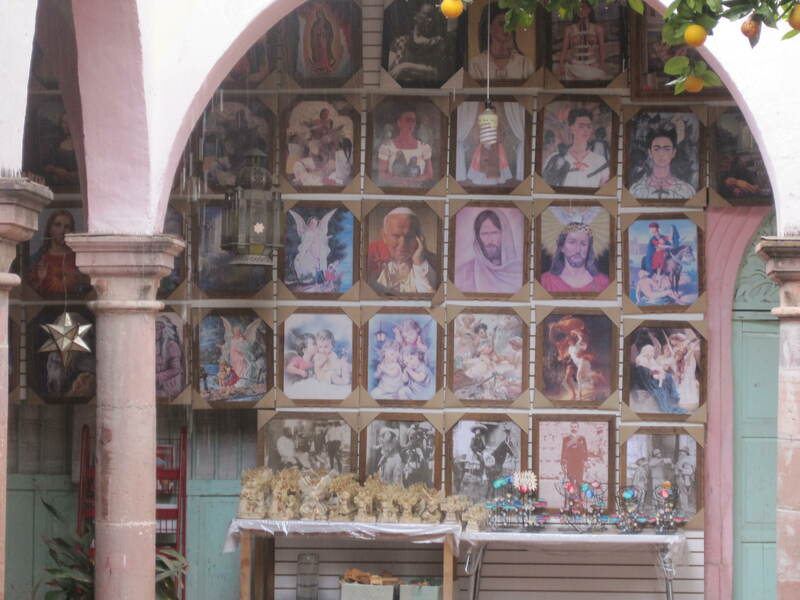 I think an Angel would be hard to find in San Miguel but I know they are there as people are always talking about Angels – their special Angels and I have seen Angel cards but I have never seen an Angel. Then I thought Bells don’t move and you can get Bells in San Miguel so I am going to draw Bells. Armed with a Bell Motif, I headed back to the bus. 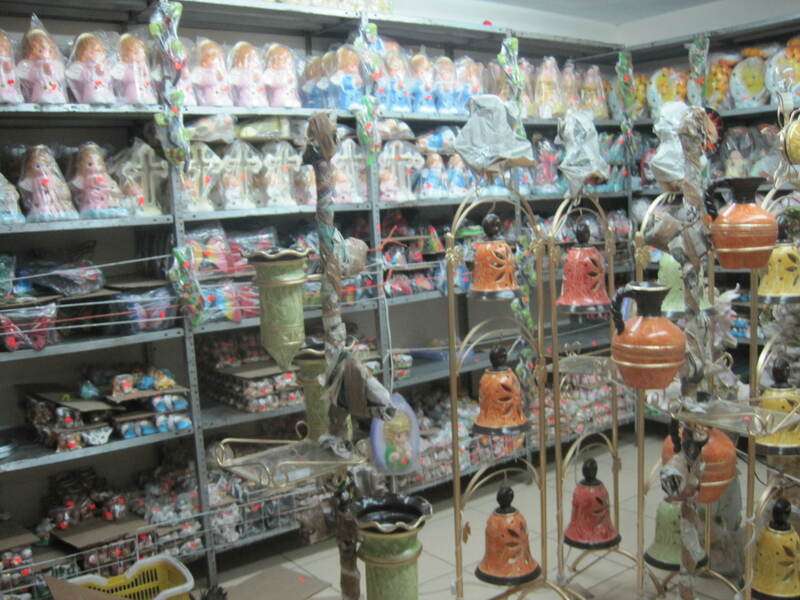 But before I did, I turned into a little shop that was inside a building. 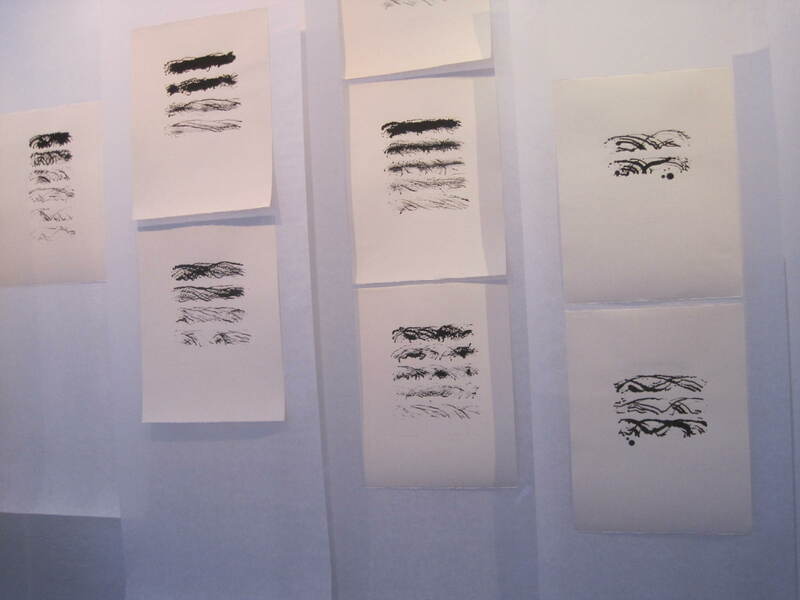 I know my Angel was directing me there because when I got inside I found the Drawing Subject Wall. I have seen this Man that is so many of these pictures before. I asked the owner who it was and he said Haysuse. I asked if Haysuse lived in Dolores and the owner said Haysuse lives everywhere. Well that wasn’t much help in locating him. Then I saw Pope John Paul II but I knew he was dead, so I focussed on the lady. 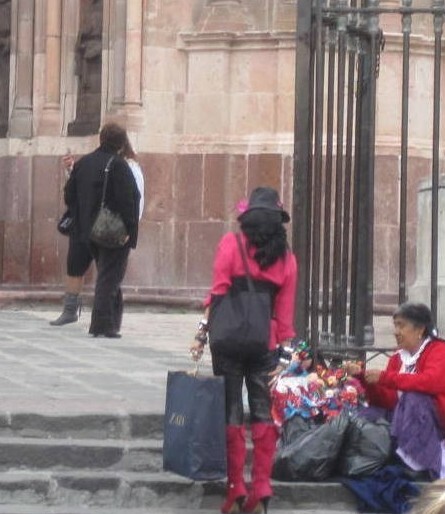 I had seen her on shopping bags but the owner said she was from Mexico City. Back to the bells. I hope the Wizard of Morelia will be happy with this choice. I will buy a very big and heavy Bell because I will suffer carrying it home . I am going to need that assistant. It is official. I am now an artist. I got tired of The Maestro bugging me to put something in my pad so drew my hand. Well I actually traced it. When I stood back and looked at it, I felt an artist’s rush and wanted to put it up but realized I needed to frame it. So I rolled it up and went to a framing store. The frame was far nicer than the drawing but I think it takes the eye of what I drew so I had them frame it. They had it ready in one day and I couldn’t wait to get it home and on the wall. The Frame does set the room off. I will now have to have a cocktail party to show off my new art. Sometimes Miracles appear as Visions. You are just sitting in the Jardin, looking around. Then all of a sudden you have a Vision. One minute she wasn’t there and the next minute she was. It is one of these three. Can you figure out which? You take time to put all the pieces together. It wasn’t until I went to the Art Court at Fabrica Aurora that I understood what Mae West was talking about. 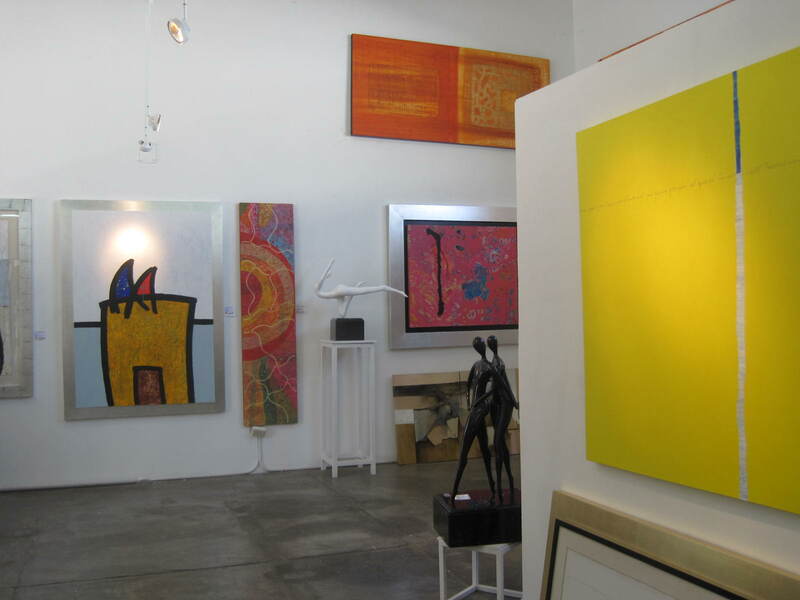 So much art, so few buyers. The art world seems to be a dog eat dog world. Fabric Aurora is jammed back with art to sell. I even noticed a sale. I didn’t know that artists had sales and discounts. Some how that $4500 price tag I saw the the Feria that other day didn’t seem as real as I thought it might be. 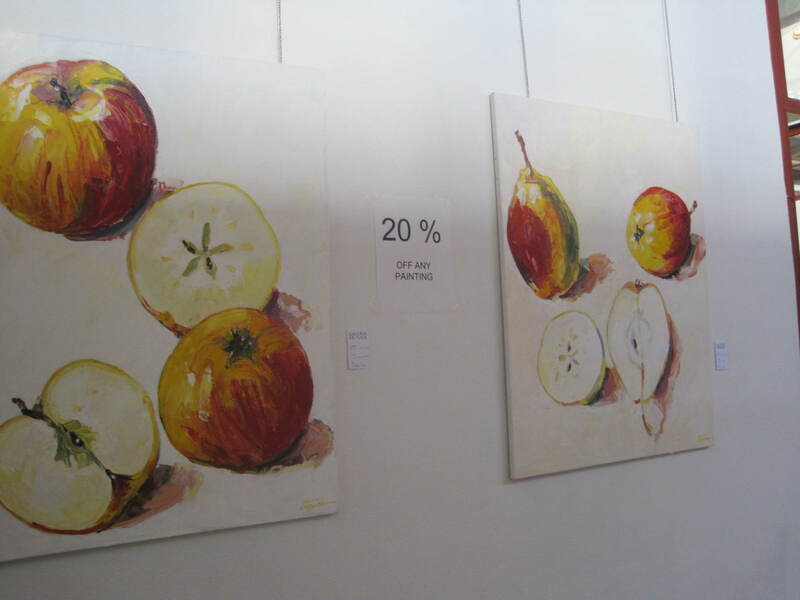 Looks you can put any price you want on a painting but that doesn’t mean it is going to get sold. 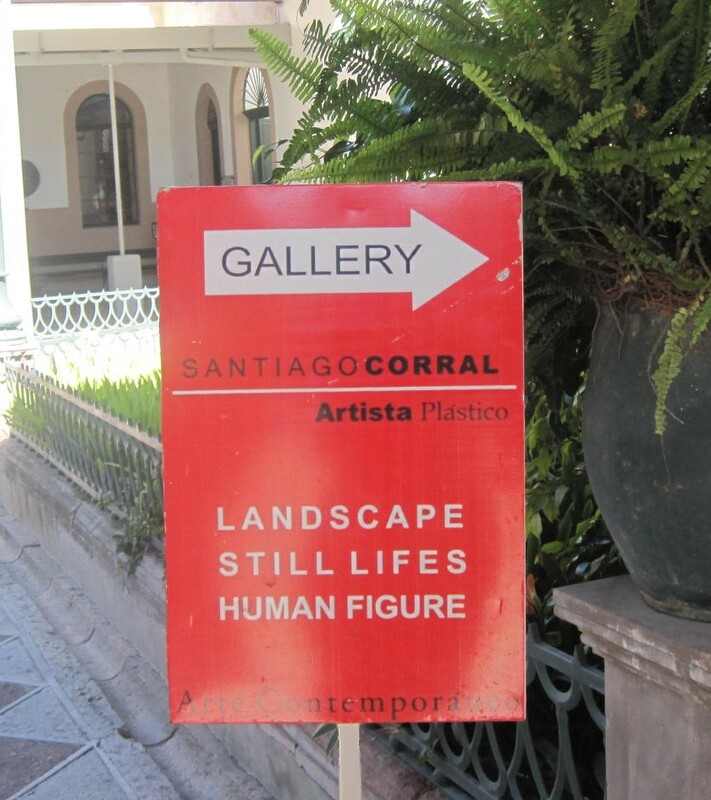 This Art world is turning out to be far more commercial than I thought I was going to be. 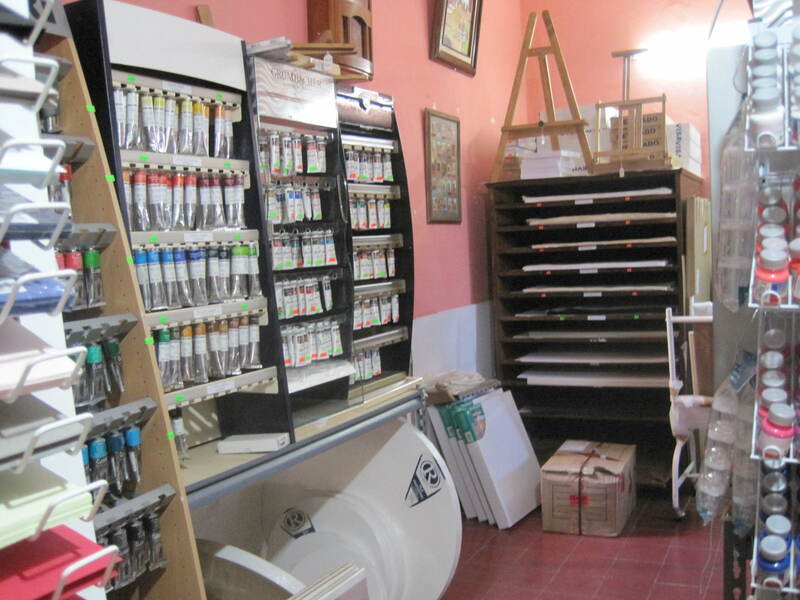 It never occurred to me that it would hard to sell paintings particularly in San Miguel where so many rich people live. Look at all the art in this room. There is so much art in this room that they even have it stacked on the floor. How can anyone paint that much and be an artist? Where do they find the time? Room after room of art, packed to the rafters. No wonder The Maestro says I have to start doing something. Okay, today I am going to draw something. I have my beret, my easel, my pencils, my brushes, my paint, my canvases, my colored paper. Damn I am going to have to hire someone to carry all that stuff for me. Yes I need an assistant. Perhaps I should advertise in Aten¢ion. Oh good I got the right accent for the c.
The Maestro said I had to look at Art. I thought great. That is a lot easier than making it. So I headed to the Fabrica Aurora. 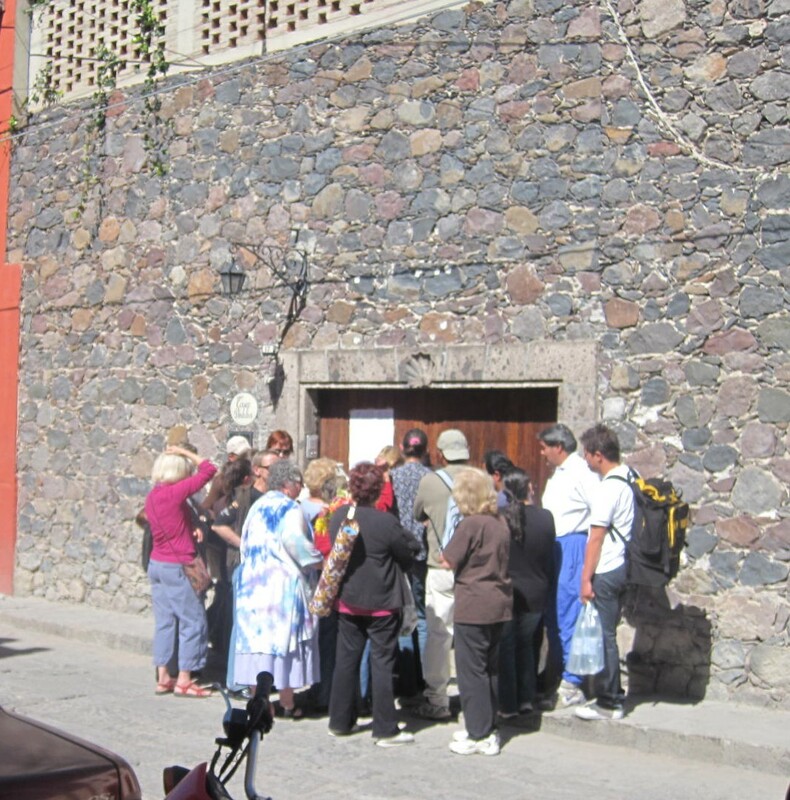 I think it is the Art Church in San Miguel because it is full of Art and Artists who have Studios where they make Art. There are also people there selling Art. It is sort of like a Food Court of Art. Imagine my thoughts when I saw this picture. What kind of art is that? I thought you had to draw Big Things like Churches and ship wrecks and Madonnas. I didn’t know you could draw food. Then I found a room full of paper and scribblings. There wasn’t just one sheet but sheet after sheet of scribblings. It was hung really nicely but there wasn’t a single picture or a person or animal or fruit – just doddles. I didn’t know you could just scribble on a page. Then I found another room of expensive paper and sticks I used to make Kebobs on the BBQ and little paper dolls stuck on them. Some even had jewels glued on them. My kids used to make stuff like that and bring it home. I didn’t know you could use Kebob Sticks and Jewels to make art. 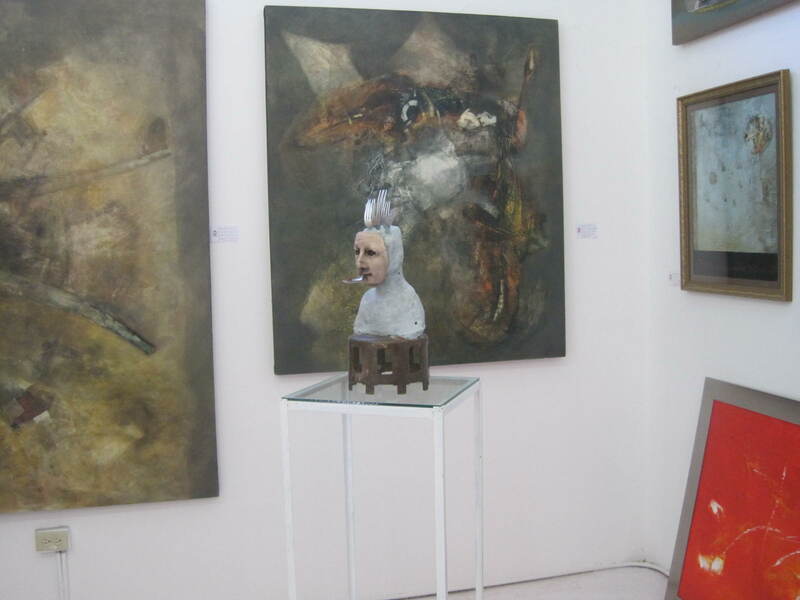 Then I found a room of sculpture and found this one where there were forks sticking out of the guy’s head and a fork in his mouth. 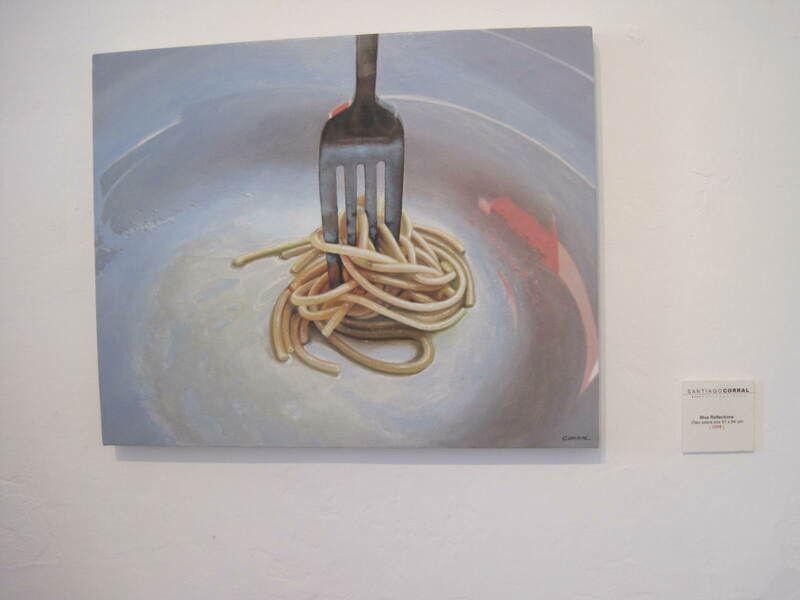 This was the second fork thing I had seen that day. I didn’t get it. What kind of a model would let you stick forks in their head? I thought maybe it was that M and M stuff I had read about and it disturbed me. I didn’t know you could stick a fork in someone’s head. Art is a lot more confusing than I thought it was. Another busy day for me in the World of Art. The Maestro is at me again to draw something. My Art Pad is quite empty. I keep telling him that I can’t start drawing until I feel comfortable as an artist so he suggested I go back the Art Supply Store and buy some more supplies. He believes that if I surround myself with Art Stuff that I will want to draw. 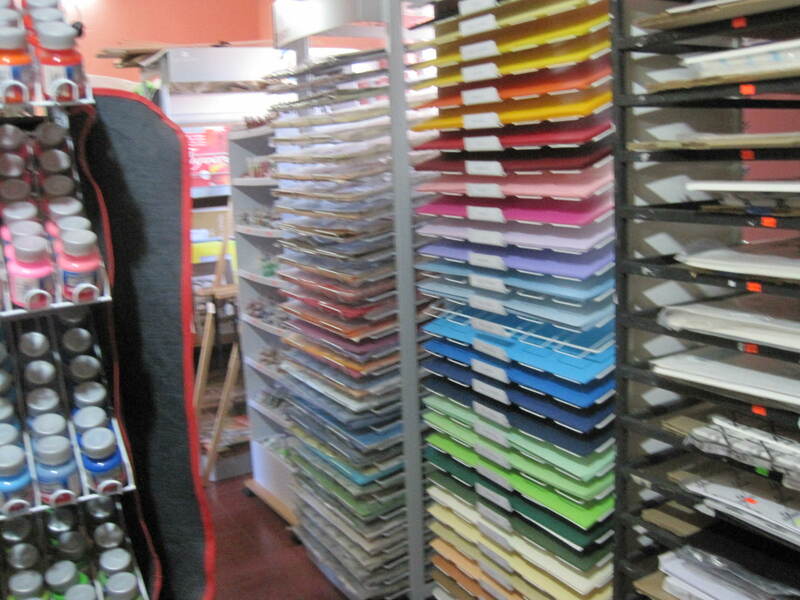 So off I trot again to El Pato (I call it the Duck Store) to buy some supplies. 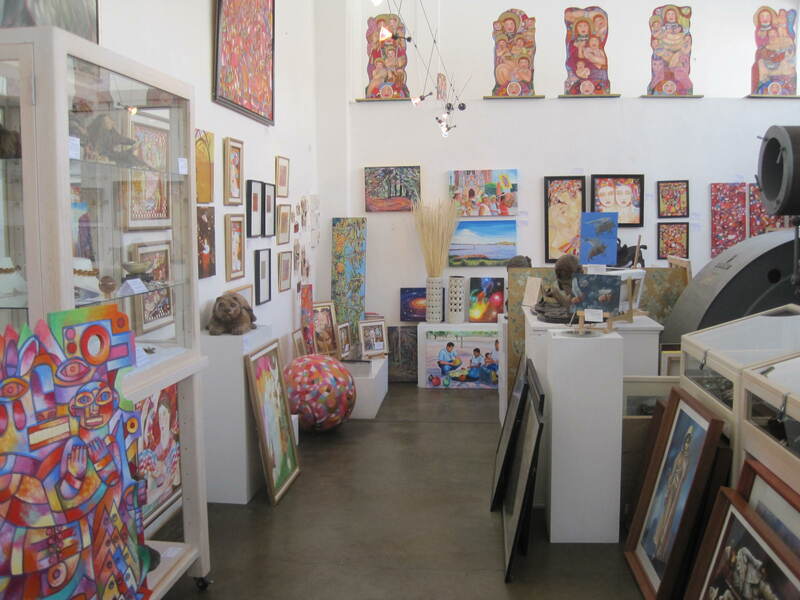 I was overwhelmed by all the Art Paraphernalia. Here I thought all you needed was a pencil and some paper. Look at all that stuff. So I bought a little bit of everything. I really like all the colored paper so I bought one of every color. I bought some paints in neat little tubes. I bought some brushes and an easel. Well The Maestro was not too happy with my purchases. He told me that I was enrolled in a drawing class and didn’t need paint or canvases or colored paper. I don’t really care what the Maestro says, he really doesn’t understand my desire to be an artist. 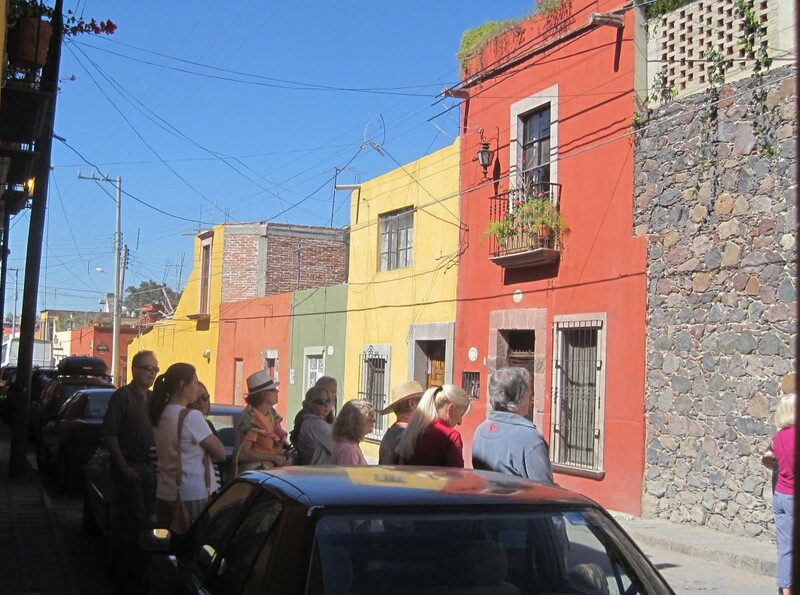 January 24, the residents of San Miguel celebrate the arrival of the Expats and Chili in 1937. 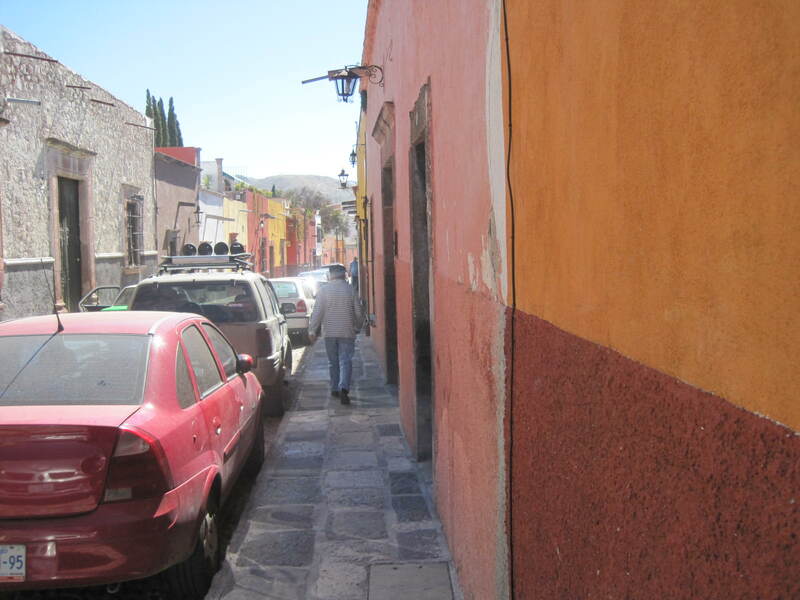 Stirling Dickenson led a band of Expats by carriage from Mexico City into San Miguel. Many Expats are moved to tears by the arrival of their ancestors and in fact many want San Miguel to return to the old days and get rid of Starbucks. The whole World Heritage Site project began after a group of Expats wanted to the world to know about Expat Pioneer Days. The Celebrations last a whole week and end with famous Chili Cookoff. At noon the gates open to public. 3:00 Live auction for some fun stuff, including 3 nights for up to 9 couples in a gorgeous beachfront estate in the Four Seasons village of Punta Mita, near Puerto Vallarta, including all food and beverage. House is amazing – right on the beach, with 3 pools, a full staff, 9 bedrooms, workout facilities. Check out their website to see pics. Chili tasting is FREE, as well as a full day of live music! Our 5 food vendors will have delicious, inexpensive food items. This year we will have one huge bar with all drinks (water, soft drinks, beer, mixed drinks), so that people don’t have to go searching for the tent that sells what they want. We’ll have lots of tables and chairs, and space for dancing! 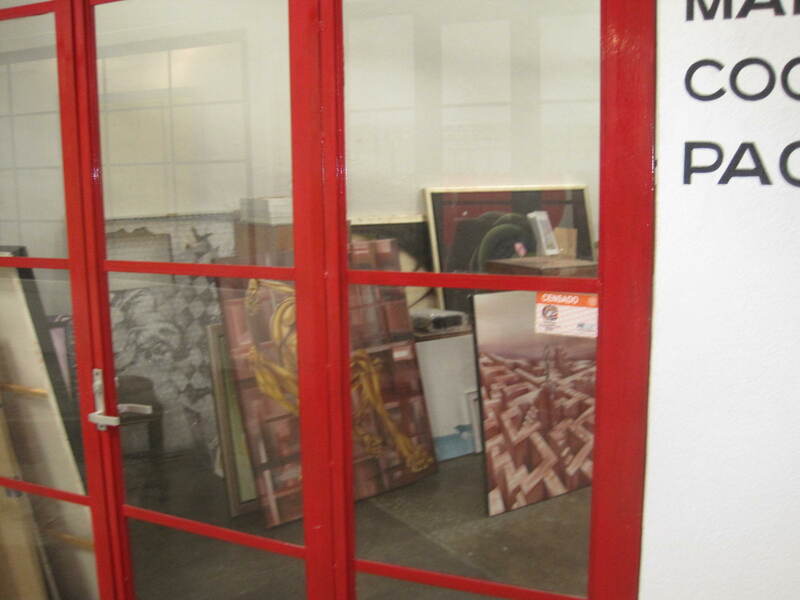 And, we have some really GREAT things in our auction booth – so come ready to shop! It is a synthesizer-backed anthem about the roles of women in society and is considered by many to be a feminist classic of the era. Gillian G. Gaar, author of She’s a Rebel: The History of Women in Rock & Roll (2002), described the single and corresponding video as a “strong feminist statement”, an “anthem of female solidarity” and a “playful romp celebrating female camaraderie. 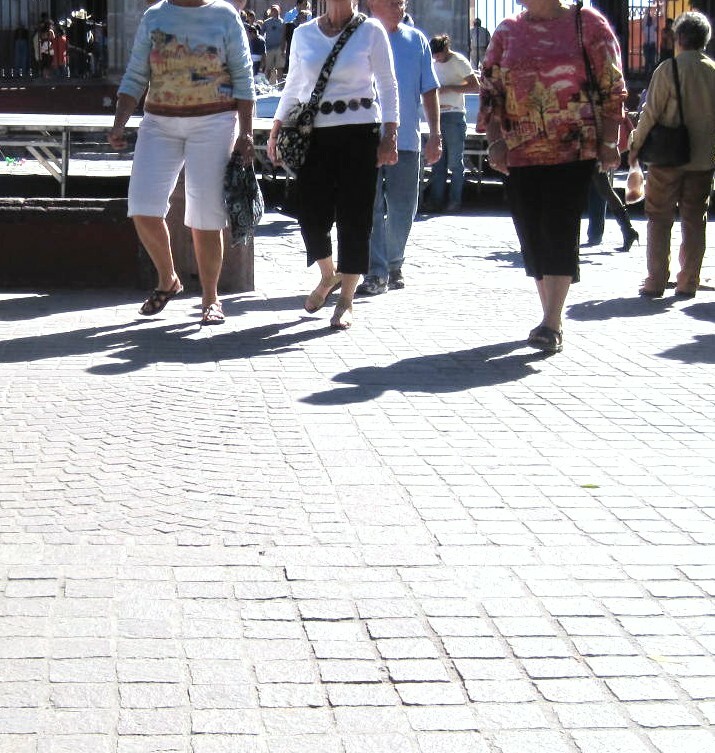 Well Girls Come to San Miguel to Have fun and the Capri Pants Gang is no different. These three gals are stepping out in the Jardin, waiting for the fun to begin. Happy Hour at Harry’s is only a short Capri Walk Away. Interactive blogging is back again. Here are two pictures of expats gathering. You decide the Event for which they are gathering. 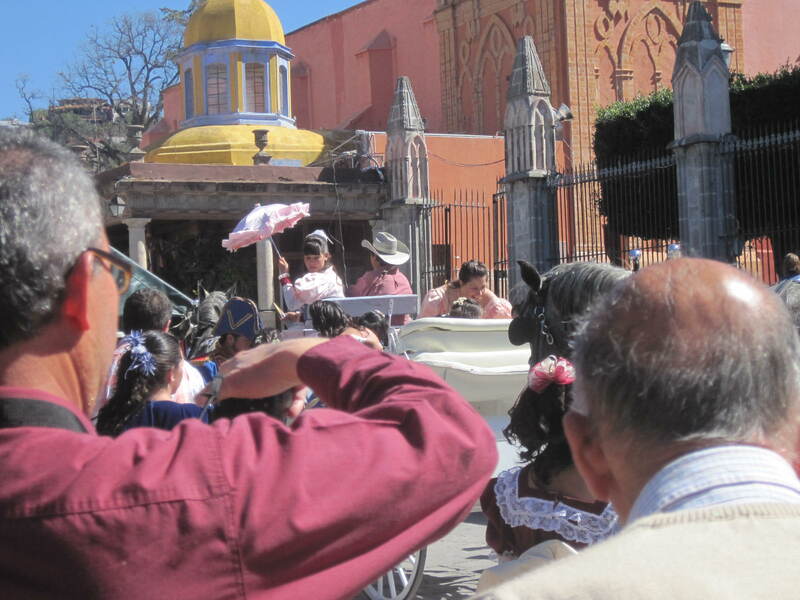 It was January 6th Three Kings Day in San Miguel. 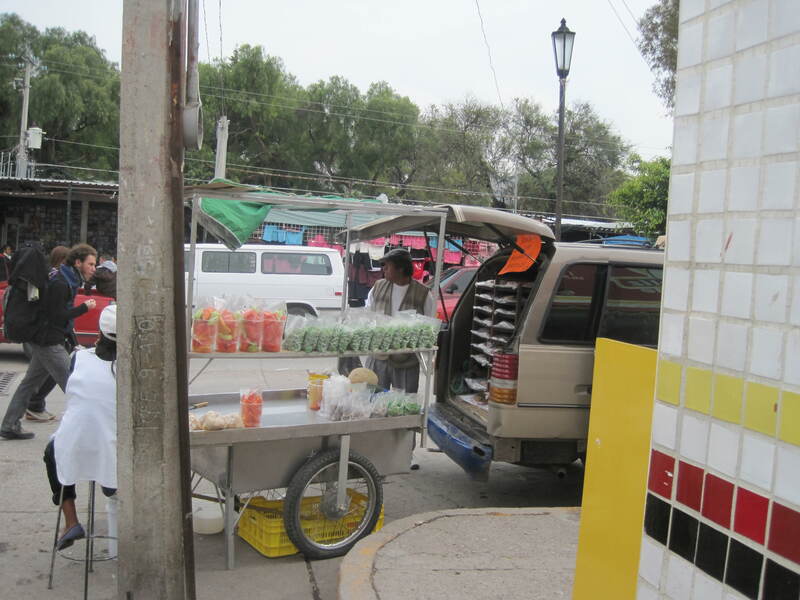 The same truck was at the corner selling Rosca de Reyes again from the back of the truck. Mary had been waiting all day for the truck to arrive. 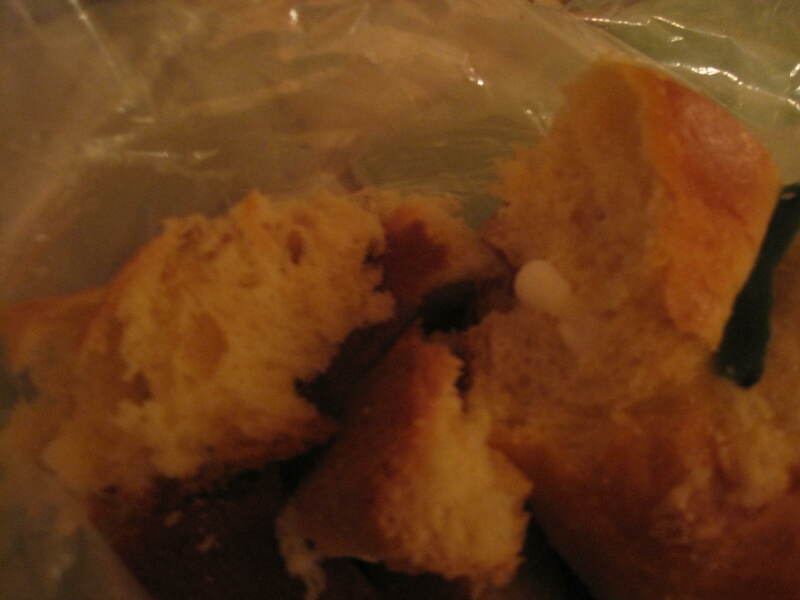 Last year, that very truck had delivered to her the miracle that had changed her life – two small babies in a Rosca de Reyes. She approached the truck, much differently this year and bought another Chica Rosca de Reyes but this time she was prepared for the Miracle. She had a Bakery Gynecologist waiting back at her apartment. 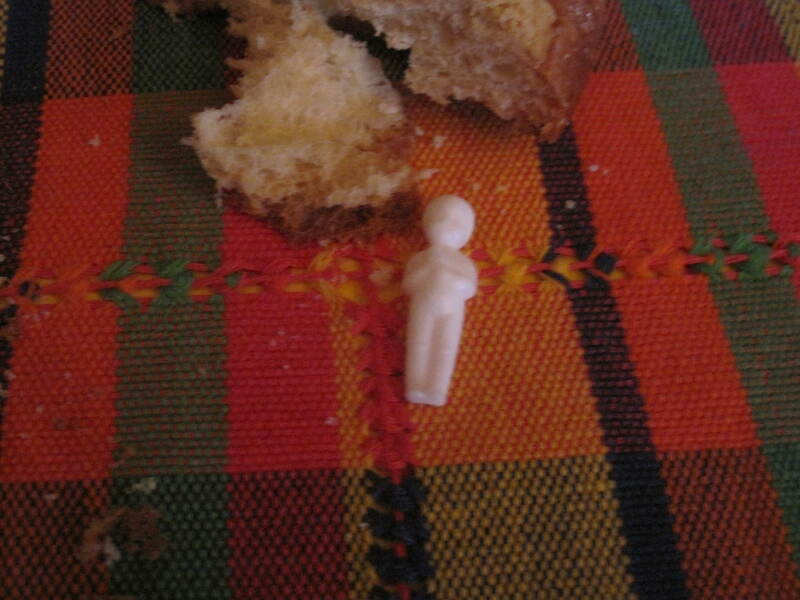 She and the Bakery Gynecologist laid the Rosca de Reyes out on a clean napkin. 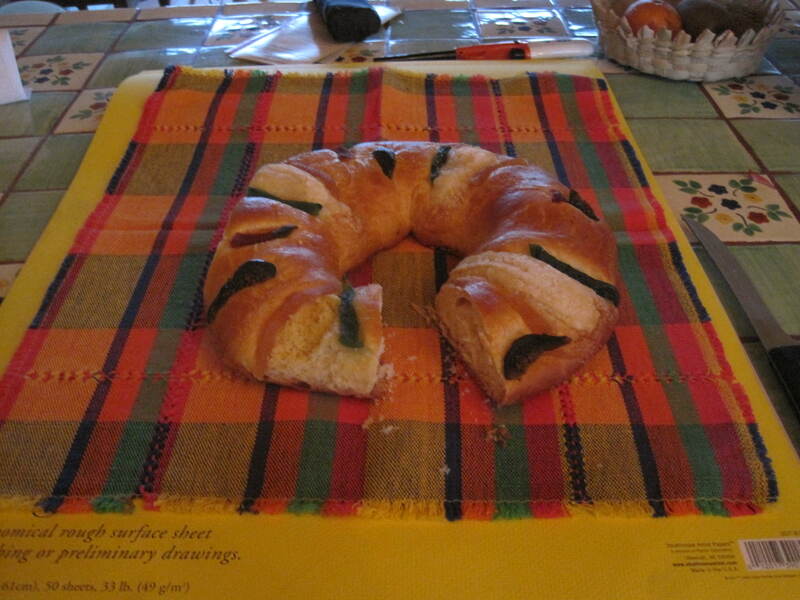 They both looked at the Rosca de Reyes and knew that a Miracle was about to occur. Mary was going to have two more babies but this time, but by Caesarian Section. . 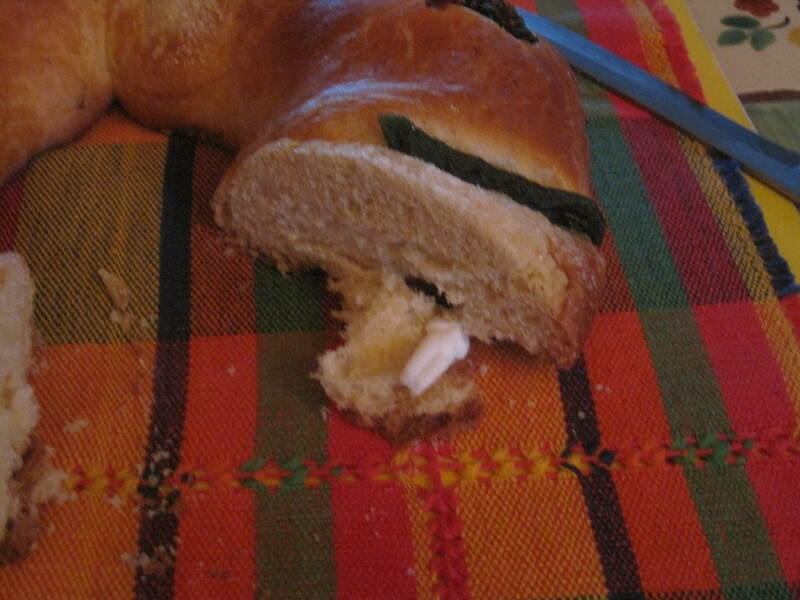 The Bakery Gynecologist made the first incision, slowly and carefully and removed a piece of the Rosca de Reyes to be examined for babies. There were no babies in the first piece. 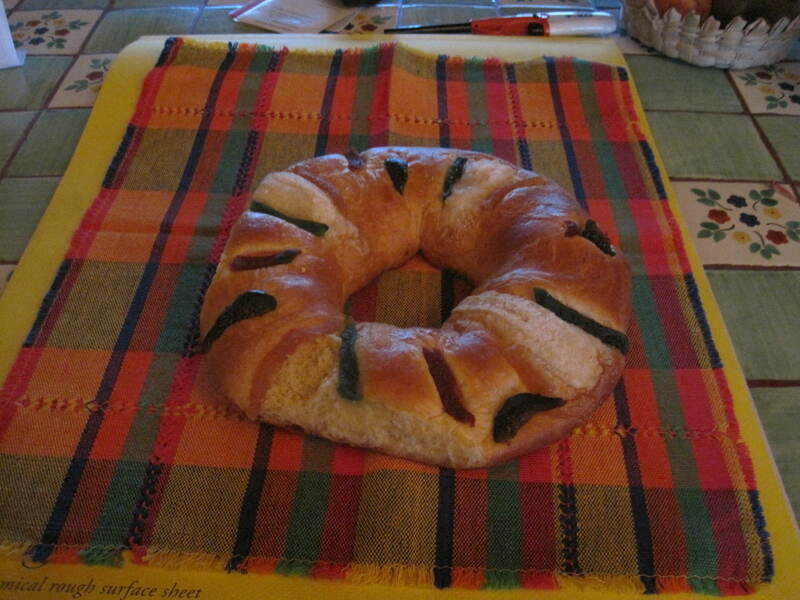 Mary became to worry that it might be barren Rosca de Reyes but the second incision was more successful. 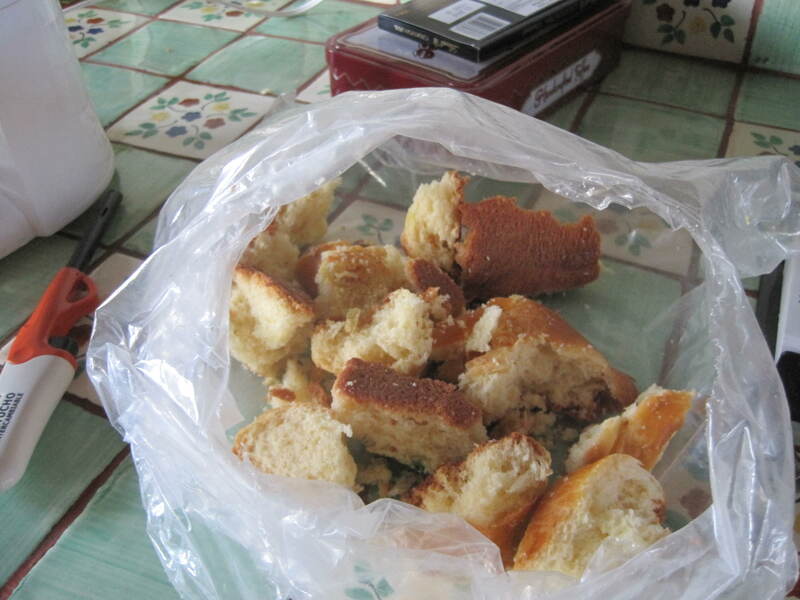 There poking out from a piece of cake was a Baby. 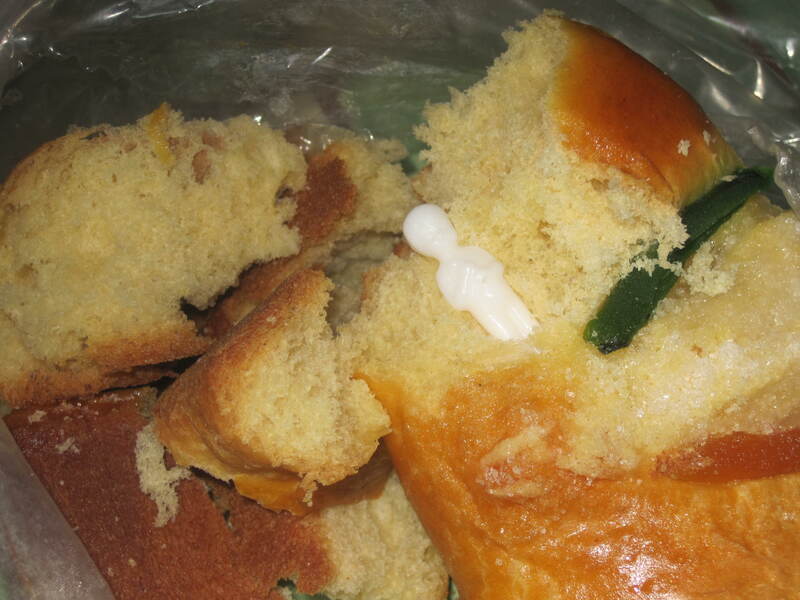 Tears flowed as the Bakery Gynecologist removed the Baby from the Rosca de Reyes and laid it on the napkins for Mary to see. Mary put the placenta in a bag and turned her attention to her new babies. She was not alone this year as she had been last year and was so glad she had used a skilled Bakery Gynecologist instead of a Midwife Pastry Chef. 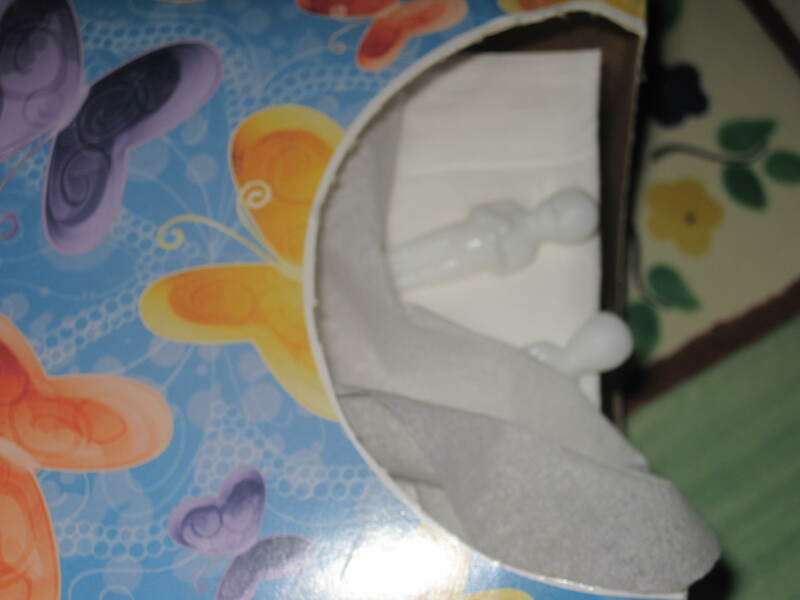 Her babies were safe in their little Kleenex box. She started to worry about next year and if maybe she was too old to take responsibility for so many children but there were such quiet placid babies that required very little care.